Calorimeter is a means of measuring the heat of chemical reactions or physical changes as well as heat capacity. A bomb calorimeter is a type of constant-volume calorimeter used in measuring the heat of combustion of a particular reaction. 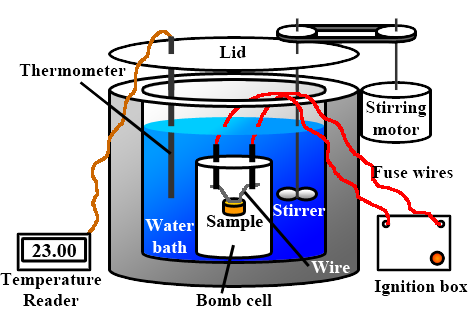 Basically, a bomb calorimeter consists of a small cup to contain the sample, oxygen, a stainless steel bomb, water, a stirrer, a thermometer, the dewar or insulating container (to prevent heat flow from the calorimeter to the surroundings) and ignition circuit connected to the bomb. A calorie is just a measurement of energy- the amount of energy needed to raise 1 gram of water 1 degree Celsius at standard atmospheric pressure. Calories in food are actually measured in kilocalories, so 1000 actual calories for every 1 Calorie listed. Manufacturers measure calories using a bomb calorimeter. This process involved placing the food source in a sealed container filled with water, and burning the food with electrical energy. After the food had completely burned up, a measurement of the water temperature is done to see how many degrees it was raised and thus how many calories were used. The calorimeters can be used to determine the calorific value of coal, coke, petroleum, cement black meal, solid biomass fuels and other combustibles. · ISO1928 Solid Mineral Fuels – Determination of gross calorific value by the bomb calorimetric method and calculation of net calorific value.